Pink Lemonade: A Star-Spangled Punch! Need a cocktail to quench the thirst of a bigger crowd this Fourth of July? 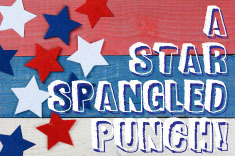 The Star-Spangled Punch, created by David Wondrich, is perfect to make for the Fourth of July, or would be great as part of a summer cocktail round up. Chilean Pisco is a spirit created by distilling wine made from grapes grown in the Coquimbo and Atacama regions of the country, fed with water that flows from the majestic Andes, then rested for a minimum of 60 days before bottling. Its versatility is boundless and allows it to be discovered in a variety of expressions, whether served neat in a rocks glass, in highly curated cocktails or over ice in a punch bowl. Muddle the lemon peels and the sugar together and let sit for at least 90 minutes. Muddle lemon and sugar again and stir in the lemon juice. Add the pisco and the water and stir. Keep refrigerated until ready to serve. Before serving, cut star fruit into ¼ to ½ inch slices. To serve, pour into a one gallon Punch bowl with a large block of ice in it and float star fruit slices.